Preheat the oven to 230°C/450°F. Cut the pork tenderloin into equal-sized chunks. In a large mixing bowl, combine paprika powder, pepper, garlic powder, sugar, salt, cumin seeds, Italian seasoning, light and dark soy sauce, sesame oil, olive oil, and cooking wine. Squeeze juice from a third of the lemons into the mixture. Marinate the pork pieces with the mixture. Slice the remaining lemons thinly and cut the butter into even cubes. 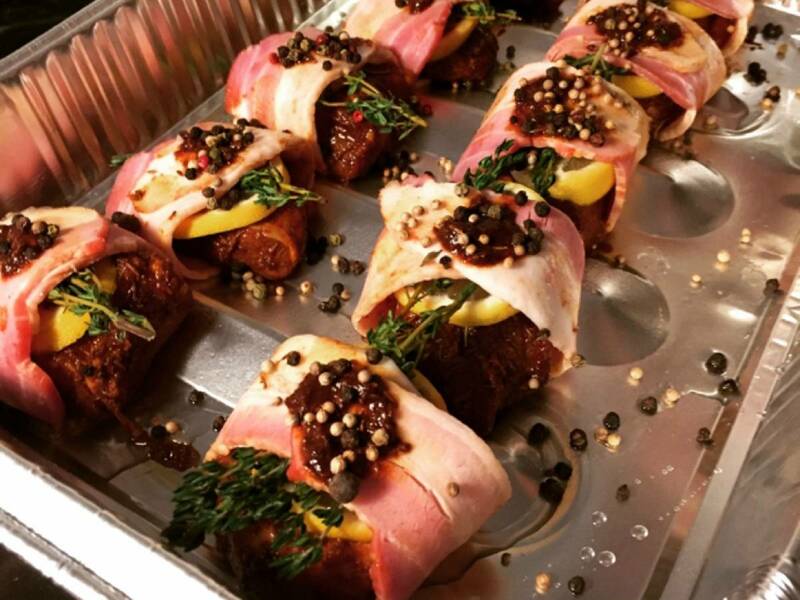 Put a slice of lemon and some thyme leaves on top of each piece of pork tenderloin and wrap with bacon, then sprinkle the whole black peppercorns and butter cubes on top of the bacon-wrapped pork. Transfer to a baking sheet and bake at 230°C/450°F for approx. 45 min. Enjoy!